A walk along the streets of Granton today, on the North side of Edinburgh. I had to stop and capture this beautiful carpet of colour in front of me. The autumn leaves are covering most of the pavements in the city just now and it makes for a wonderful, if sometimes slippy walk into town. Stunning colours falling from the trees recently, the hues of the leaves are particularly bright and strong this year. I can’t think of a better city center place to see this than in the Meadows park. 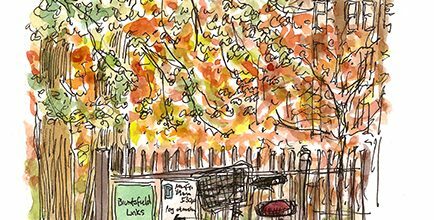 The Sketcher family had a great afternoon playing in the leaves at the Botanics yesterday. The twins are toddling around now and were loving running through the leaves and rolling about.